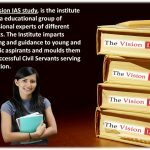 The Vision IAS is best institute in Chandigarh made for professional IAS seekers students. It is situated in sector 15 D Chandigarh transport facility is available to this route towards Sector 15D from any corner of Chandigarh or any corner of Punjab, Haryana and Himachal Pradesh. We are serving for our students for more than 10 years in Chandigarh. Our Aim is to be largest and most respected institute in term of IAS study centre. We will continue to support our students with the latest version of books and study material.